One of the hazards of driving at night is being dazzled by the headlights of oncoming vehicles. Traditionally this problem has been caused by the other driver forgetting to dip their lights, or by a badly adjusted lamp fittings where typically one of the cars two headlights will dip fine and the one that is out of alignment will dazzle. In recent years I have noticed an increase of instances where the car coming towards me has dazzled with both headlights even though they are dipped, in most cases the light given out has that blueish tinge that gives it away as coming from a vehicle where the factory fitted halogen headlight bulbs have bee replaced by retro fitted a HID Xenon conversion kit. DIY HID headlight conversion kits are widely advertised by sellers on Ebay and Amazon, and they are even available from the web site of the motor factor Eurocarparts. Now it is perfectly legal to sell Halogen headlight to Xenon HID kits and it is not illegal to fit them, but with them fitted the your vehicle is not road legal so you cannot legally drive it on the public highway. The reason for this is all to obvious to all of us who have been dazzled and dazed by HID converted oncoming cars. But car manufacturers fit HID Xenon headlights to their new cars? 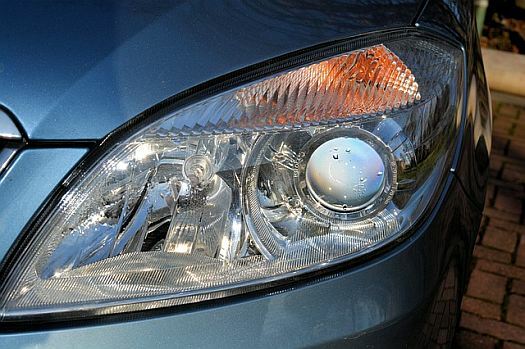 Increasingly car makers do fit Xenon headlamps, either as standard or an optional extra. They are reasonably easy to spot as they approach with their stronger beams of whiter light, but dipped they do not dazzle other drivers. “And why is that?” you ask, “When the home converted ones cause problems. What is the difference?“. Well HID (High-intensity discharge) Xenon headlight bulbs and Halogen headlight bulbs work in very different ways, they are designed very differently and throw out the light they produce in a very different pattern. Car manufactures therefore design very different headlight housings and reflectors for the two types of bulb to cope with their individual characteristics. Factory fitted Xenon headlamps are made to give an optimised performance lighting the road ahead without being a nuisance to other traffic. Headlights designed for Halogen headlight bulbs are designed for just that, halogen bulbs, put a Xenon bulb in and you get a brighter whiter light but it is not being directed where it should be, hence the disturbance to other drivers. The YouTube video below comes from the motoring magazine Auto Express who demonstrate the problems with HID retro fit kits.